- History lovers looking to explore a plethora of attractions such as caves, manor houses and museums. - Couples and groups seeking a quiet and tranquil holiday. - A scenic backperfect for long, afternoon drives through the valley. 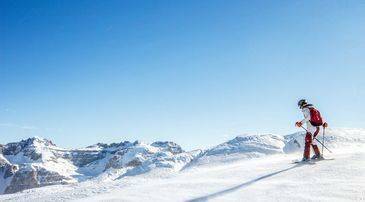 Dating back hundreds and thousands of years, the cavernous terrain of Les Eyzies de Tayac is steeped in history, having once been home to our prehistoric ancestors. This is therefore Dordognen region, making it well worth a visit. Nestled alongside the Vezere River, Les Eyzies de Tayac presents a network of winding country roads weaving their way through the scenic cliffs and sweeping forest of the Vezere Valley. In fact, a simple drive around makes for an afternoon well spent - with plenty of picturesque scenery to take in along the way. Hidden amongst the valleys are small villages, peppered with humble stone cottages surrounded by pretty gardens. It’s here that visitors will find simple, family-run restaurants and creperies. An afternoon or evening spent dining in these local establishments, perhaps with a glass of locally produced wine is highly recommended. It really doesn’t get more authentic than that! If there's one thing that holidaymakers come to Les Eyzies de Tayac for, it's the caves. In fact, it would be a sin not to spend a day or two exploring these mysterious openings found in the valley's cliff face. 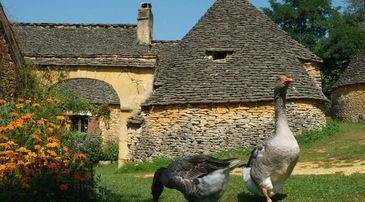 Attractions such as Grotte du Sorcier, or The Sorcerer's Cave, Roc de Cazelle and Grotte du Grand Roc offer fascinating walking tours around these medieval dwellings. Once a settlement for neanderthals, many of these caves are now decorated with beautiful, pearly stalagmite and stalactite columns worthy of a visit in their own right. Better still, some of the interior walls display engravings and markings dating back tens of thousands of years, providing visitors with a rare insight into prehistoric life. This is a unique opportunity not to be missed, for both its educational value and sheer 'wow' factor. Along with its impressive caves, Les Eyzies de Tayac is also home to stunning ruins and a well-known museum. The ruins of Chateau de Commarque can be found hugged amongst the surrounding rolling emerald hills of the Vezere Valley. Dusted with grassy patches of moss, this historic site offers an insight into the lives of the Beynac and Commarque families as far back as 15,000 years ago. If you're walking or hiking in the region, this site makes for a great stop-off point along the way. The National Prehistory Museum is another must-visit for those interested in Les Eyzies de Tayac's unique past. Displaying rare collections of the tools and weapons made during human settlement in the nearby caves, the museum's displays illustrate a clear picture of what life would have been like in the prehistoric ages. Exhibitions also include animal remains, clothing and even jewellery. The Vezere River meanders its way through the Dordogne region, lazily enticing visitors to see what is has to offer. 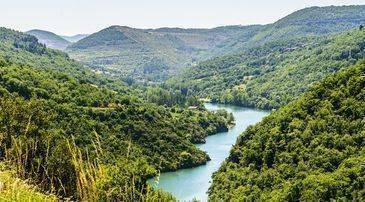 Whilst you can steal a peek of the river from above during a walk or drive through the valley, one of the best ways to enjoy the Vezere is on the water itself. Canoe and kayak rental is available from Les Eyzies de Tayac for both adults and children, and guided tours are also an option. The courses journey you through the stunning depths of the valley, around beautiful forested areas and amongst the fascinating caves and ancient chateaus that make this area so special. If you want to experience Les Eyzies de Tayac in all its natural glory, there simply is no better way than this. For an educational but fun day out for all ages to enjoy, the Aquarium du Perigord Noir is just a 15 minute drive from Les Eyzies de Tayac. Home to hundreds of freshwater and tropical species, including piranhas, sharks, snakes and even alligators and crocodiles, there is plenty to see here in the way of wildlife. Guided tours, feeding hours and touch pools provide the perfect opportunity for younger members of the family to get up close and personal with the a range of exotic species originating from all corners of the globe. Being such a quaint part of the Vezere Valley, Les Eyzies de Tayac offers a handful of small restaurants dotted amidst its winding roads. Albeit a somewhat limited range, the restaurants here offer freshly cooked dishes, reminiscent of the traditional techniques and flavours of France. Visitors can expect to see hot soups, fresh bread, duck, and tart tatin on the menu, to name but a few classic dishes. If you're in search of a broader selection, the Dordogne region offers endless choice. Whether the finer flavours of Michelin starred chefs appeal, or the rustic goodness of hearty, home-cooked plates - you'll find it here. 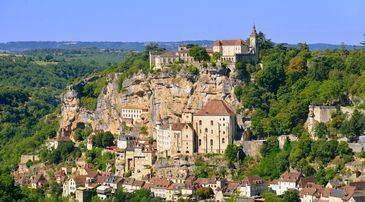 Areas such as Domme, Sarlat-la-Caneda, and Tremolat each play host to some of the top picks in the Dordogne region, and are all within driving distance of Les Eyzies de Tayac. Dordogne's many rural towns and villages also run local markets throughout the week, so a short drive into neighbouring areas is recommended for a self-catering trip. You can expect to find all of your day to day amenities at the markets such as fresh vegetables, cured meats and fruits that are ripe and ready to eat. During the warm summer months, the markets become quite the event in the Dordogne region. Often running well into the late hours, locals and holidaymakers alike can make the most of freshly cooked meals from the stalls, and dine al fresco with a large glass of locally sourced wine to match. As if the fresh food and drink wasn't enough, live music entertainment has been known to feature at some of the markets, too!